Wow guests at your wedding. 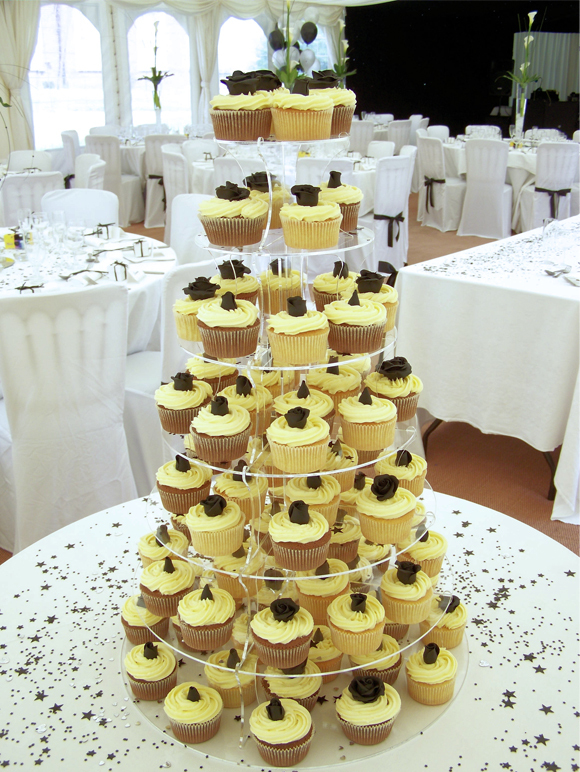 A cupcake tower adds height and can create quite a spectacle at even the smallest of occasions. Every cupcake is individual and your guests will appreciate the exquisite nature of each one. Easy to serve and to eat or take home, a cupcake tower is a fuss-free way to make every guest feel special. The cupcakes can be topped with buttercream and decorated with handmade fondant designs or iced with flat fondant and decorated or piped onto with patterns or initials. The designs can take inspiration from all sorts of aspects of the wedding. They can begin with the colours you have chosen for the wedding, the flowers in the bouquet or the decorative flowers throughout the venue. We could start with a detail from the wedding dress or an illustration on the invitations. Some couples like to base the design on their initials or their joint hobbies or the honeymoon destination. There really is no limit when it comes to the design. A good base for cake toppers. Cupcake towers are a stunning centrepiece on their own but you can also have a small cake on top. Some couples like to take this cake home to enjoy with their immediate family or simply as something to cut in the photographs. The design of the cupcakes would simply extend up to the top cake which is also a good base on which to stand cake toppers. 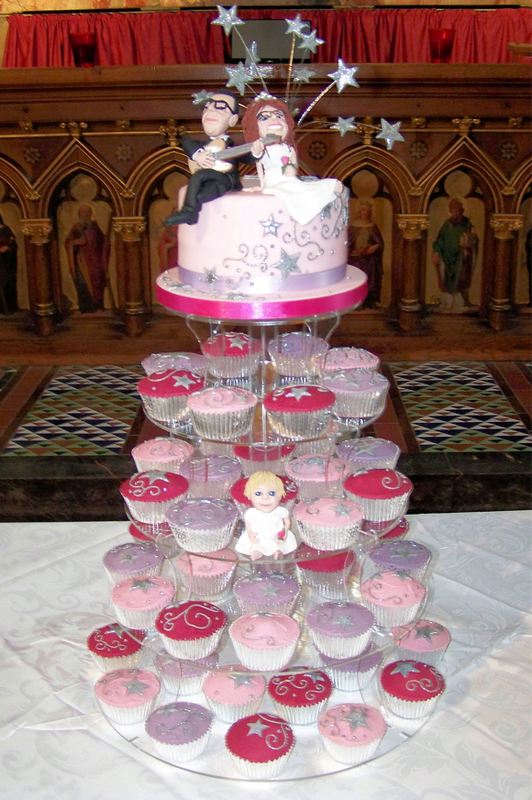 We have had some cupcake towers where toppers of the bride and groom stand on the top tier and the bridesmaids and best man are interspersed throughout the lower tiers of cupcakes. We've also been able to include some family pets in this way too! With a minimum order of 24 , you can have up to 3 different flavours depending on the amount ordered. Wedding cupcakes start at £3.00 each and the price will increase with the flavour and difficulty of the design. The top cake looks best when it is either 6” or 8” (round or square). Larger or smaller cakes just don't look right proportionally. 6” cakes start from £65 and 8” from £85. If we haven't listed your favourite flavour, or you're looking for something a bit different, then just let us know and we'll see what we can do. For dessert or as wedding favours. 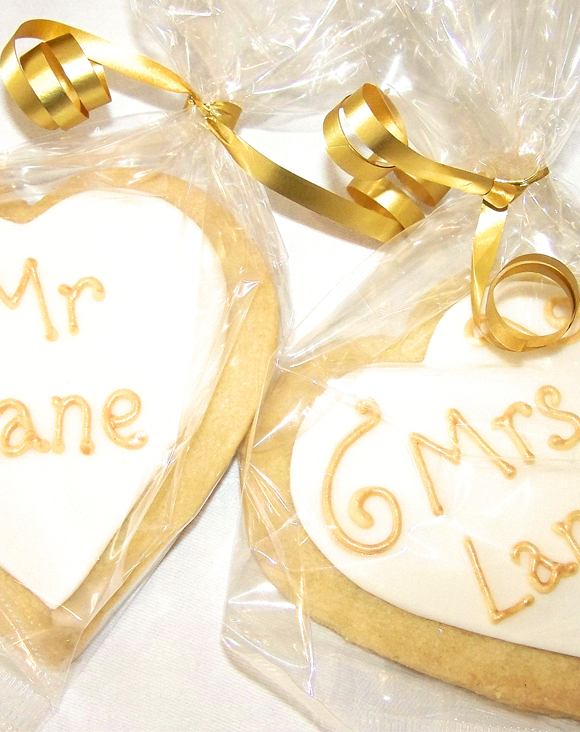 We can also make iced biscuits to match the cupcakes which can be displayed as part of the dessert or packaged as wedding favours. Delivery is free within a 5 mile radius of our shop in Eastbourne and then charged at £1 per mile thereafter. We give delivery times of 1 hour 'slots' to allow for traffic and other delays. We will ask for the phone number of the person who will be receiving the cake in case of emergencies. 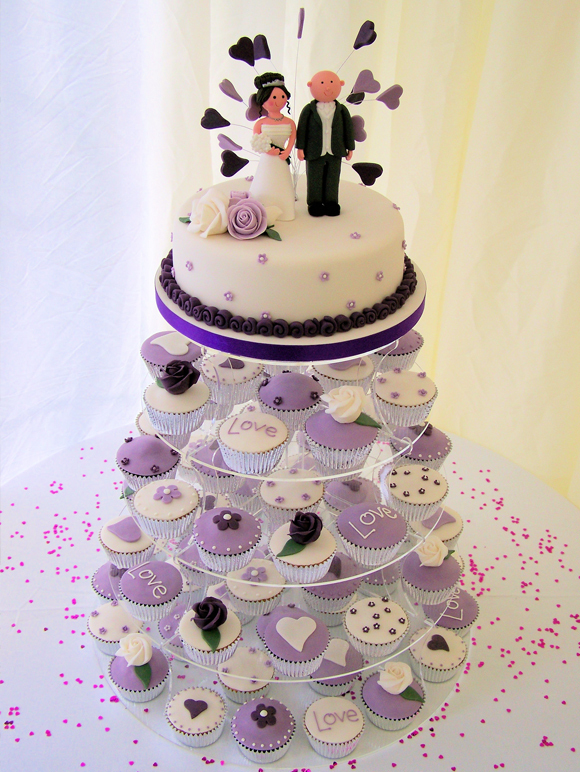 We will set up your cupcake tower on the day of your wedding as specified by you and/your wedding planner. You are welcome to collect your cakes from us, but it will then be your responsibility from the moment it leaves our care. We have clear acrylic cupcake towers to hire or you can source your own. In this case you would have to ensure that it was pre-built and waiting for us to decorate at the venue when we deliver. We charge £25 to hire our stands, with a £50 refundable deposit and we ask that it be returned to us at our shop at some point within the week following the wedding.